Transitional designs mainly narrate the delicacy and prettiness of the room. It is decorated with textile stuff and wooden furniture which gives a modern look. The design brings elegant look and creates a great impression on ones mind. The interior design textures are neutral in color and gives a classic look. It stables the taste of virile and feminine assigns for a beautiful design. Here are few designs of transitional bedrooms which can be helpful in designing your interior. Generally a bedroom consists of a bed, in transitional design the furniture is made of walnut, Douglas, Poplar, Birch, pine and Mahogany wood. The room has night stand, floor lamps, chaises, dressing table and light fixtures. In the view of the image you can see a transitional style master bedroom which has a jazzy look. The interior is decorated with the dark blue wall paper which is eye catching in the room. There are casement windows which are covered by white curtain blinds and the flooring is made of plain vinyl flooring. The false ceiling is pop ceiling with simple light fixtures and has a crystal chandelier attached to the roof. The room has a bed with a long designed headboard and blue cushions. It also has leathered chairs with a stand which has decorative lights on it. The room has night stand with the lamps which are modern. The interior is designed with monochromatic color and the false ceiling is dry wall ceiling. The flooring is made of plain vinyl flooring and has a leather bed. The bed has thick coverlet and creamy cushions. The room has two leather settee for seating and it has night stands with lamps and has decorated with photo frames and display items. The room has indoor ornamental plants which gives a fresh look and it also has windows covered with the draperies. The rooms has chairs for seating or getting relaxed and has textured carpet laid under it. The interior is decorated with abstract painting and photo frames mounted on the wall. The room is designed with a classic look. The false ceiling is a plaster of paris ceiling which is suspended under structural ceiling with the hidden lights for illuminating the room. The bed has upholstered headboard with a quilt and cushions in the room. The room has chaise with cushions for relaxing and can even have a nap on it. The room has tables made of metal used for serving casual drinks. The interior has night stands with lamp and the walls are decorated with wooden cladding. The room has picture windows and are covered with the draperies. This type of design can be preferred if you have allotted for your bedroom. 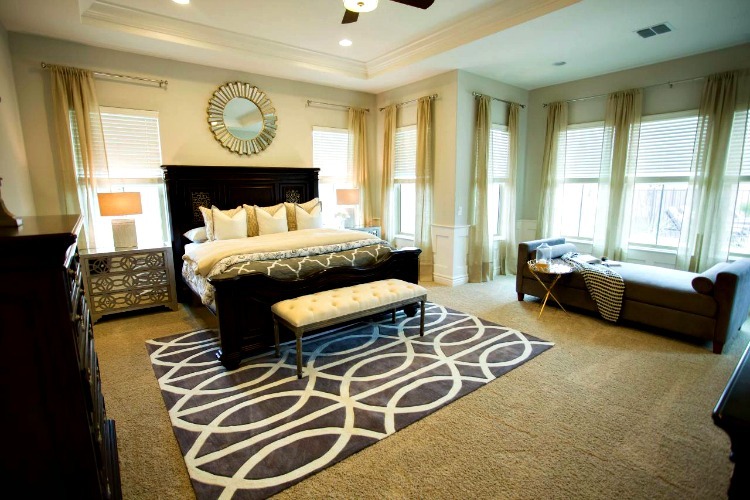 This image views a transitional style master bedroom and looks elegant with light blue textures. The false ceiling is a dry wall ceiling with a crystal chandelier and the flooring is made up of mahogany wood with olive green abstract glamour throw rug on it. The bed is is designed with a wing back upholstered bed and has snowy white quilt with dark blue cushions. The interior has a leather seated bench and chest of shabby chic drawers with lamps on it. Metal framed mirrors are mounted on the wall and has cutup windows which are covered with two finger draperies. 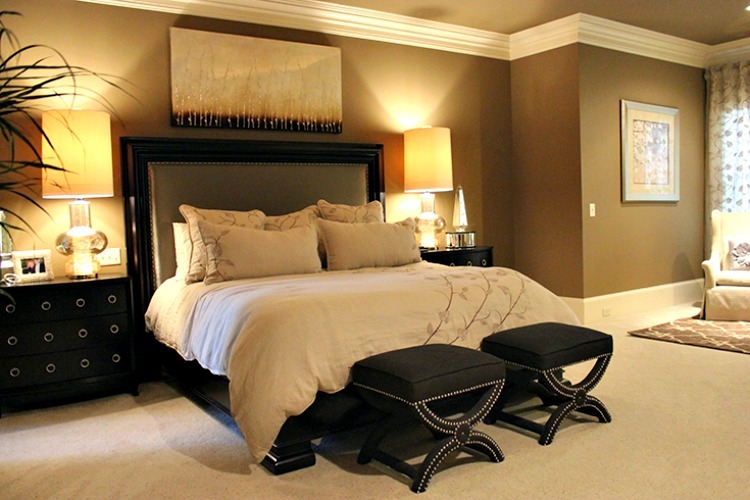 The interior design of master bedroom is classic which monochromatic color and is elegant. The false ceiling is pop ceiling with a ceiling fan attached to the roof and the floor has plain vinyl flooring. The interior is decorated with the double hung windows and can be covered by tab top draperies. The room has orbed mirrors mounted on the wall which reflects the beauty of the room. The room has night stand with lamps and decorated with photo frames and has chaise for seating. There is an extra large mirror and has dark wood cabinets for storing accessories and on the top of the cabinets there are books and gold accents display items. 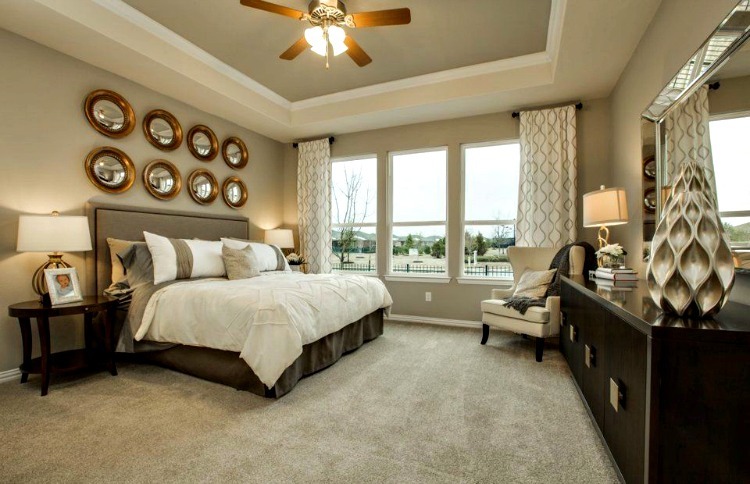 In the view of the image you can see an elegant interior of transitional style master bedroom. The room has white framed casement windows where we can view the outdoor garden and it makes you feel pleasant. It also refreshes your mind and the windows are covered by draperies. There is a dressing table with the drawers for storing accessories. The false ceiling is a dry wall ceiling with the simple and cheap light fixtures. The room has a bed with saturated color pillows and coverlet and behind there is a wooden panelling on which lamps are placed. The walls are decorated with a wall paper and photo frames. The flooring is made of dark wood with a plush carpet and has couches with a coffee table. 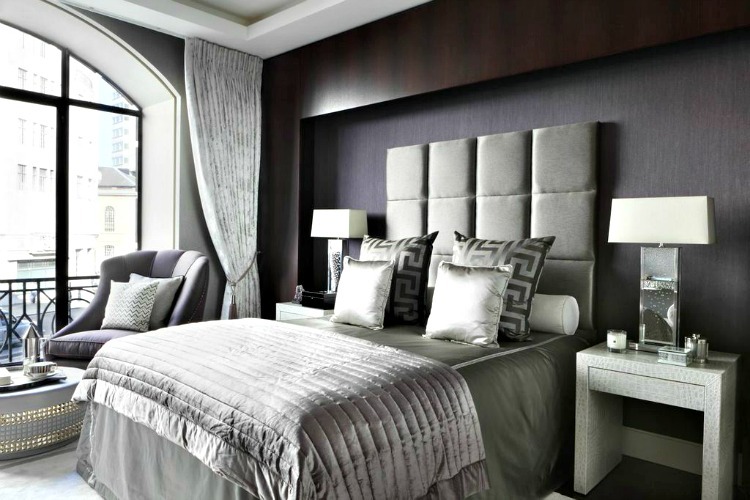 This type of interior can be designed if your bedroom is baronial. The interior design has hazelnut wallpaper and is decorated with beige color. The false ceiling is a deep ceiling and a candle chandelier is attached to the roof. The flooring is made of laminated mahogany wood with a glossy look and has a velvet plush carpet laid on it. The room has chest of drawers with a lamp on it and has blinds. The room has windows covered with three fingered draperies and has a bed with tufted headboard, cushions and a duvet. The room has a chaise for seating along with a table beside it. This image views an amazing transitional style of master bedroom. The false ceiling is pop ceiling with simple light fixtures and has ceiling fan attached to the roof. The flooring is made of wood and has laid a plush carpet on it. The room has bed with wooden head board and has quilt and cushions. The entire interior is decorated with the casement windows with the white blinds and has covered with sheer draperies. The room has metal framed gold accents mirror and has a night stand with the lamps. It has a day bed to have a nap and has chest of drawers to store the accessories. This interior designed can be preferred if you have a small space. The room looks classy with its neutral color and has dry wall ceiling with pendant lights attached to the roof. The flooring is made of laminated hardwood and has saxony plush carpet on it. There is a platform bed in the room with cushions and grey coverlet. It also has a bench for seating. The room has chest of drawers for storing things and to place decorative items on it. The walls has white textures and has a beautiful floral painting. This image is an amazing transitional style bedroom and the interior is decorated with snowy white color which has a fabulous look. If you are looking for transitional style which gives alluring look, this design suits for your interior. There is light and dark brown accents soft wall paper which dappers the entire room. The interior has a contemporary swerve fabric bed with brown cushions and quilt in contrast with it. The flooring is made of plain vinyl flooring which is glossy with a black carpet. The interior has wooden cladding and closet for placing things on it. The room has a night stand with glass closets for storing books and has a lamp on it.